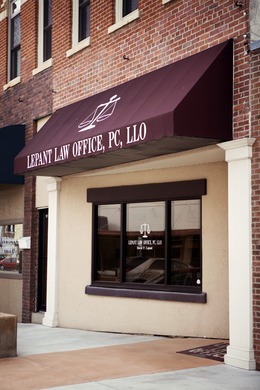 Lepant Law Office, PC, LLO is a successor firm to the law offices of Merrell Andersen and the several partnerships in which he was involved over his thirty-five year career as a Nebraska attorney. David Lepant carries on Mr. Andersen’s legacy of offering competent legal services in Southeast Nebraska. Lepant Law Office offers a variety of legal services to satisfy the needs of our clients. We are friendly and caring and strive to serve our clients to the best of our ability. The attorneys at Lepant Law Office are licensed to practice law in the State of Nebraska and serve the Southeast area of the state. Pictures of the various courthouses, in which David Lepant have practiced, may be viewed in the Courthouses of Nebraska section of this site. Dave and Michael accommodate their client’s needs by meeting them in their offices in Beatrice, as well as, in hospitals, nursing homes or client’s own homes. In addition to this office, Dave Lepant is also a partner in the firm of Lepant & Lentz, PC, LLO, which is located at 601 Old Cheney Road, Lincoln, Nebraska. Further information and help can be found at that office's website: Lincoln Bankruptcy Attorney. This new website features an online questionnaire where potential clients can gain information about bankruptcy and how it applies to their situation any time of the day, any day of the week. © Lepant Law Office, PC, LLO, 2019. All Rights Reserved.